Designed for use with our REDline™ Carrier board, this Module provides all necessary interfacing and bridging capabilities for direct connection of the AURIX™ MCU Platform Module to the original Aptina Imaging™ (now ON Semiconductor®) sensor product line. Compatible with multiple resolution, CMOS/CCD type, and monochrome/RGB image sensors. Supports up to 16-bit parallel RGB interface (Data, HSYNC, VSYNC, CLK). 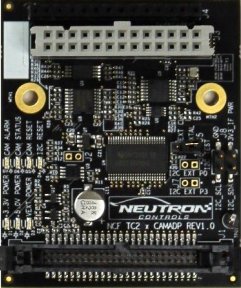 The Module allows DEMO 2X series of image sensor evaluation board being directly plugged into it, while connecting the Module to REDline™ Carrier board with variable length off-the-shelf twisted pair ribbon cable. Highly configurable Master PLL-based source allows image feed synchronization to either local oscillator or AURIX™ MCU core clock frequency. A complete hardware development support package is available including: schematics, BOM, layout, gerbers, PCB stack-up, and high-speed signal design rules.